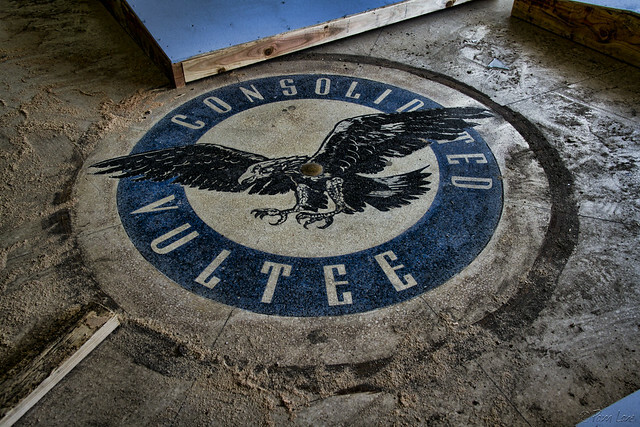 The first time I saw the Consolidated Vultee logo, I was looking through a window into the entrance to their abandoned old administration building. (See Consolidated Vultee for a view through the window.) With the window reflections, it was a little hard to see clearly. Now, these old buildings are being restored and repurposed. The buildings are part of what used to be a huge site where aircraft were built for WWII and, later, space shuttles were constructed. Now it is being developed into a mixed-use site called The Promenade. Part of the agreement with the developers was that the administration building be restored and that the Vultee and later aeronautic history be preserved. A kind watchman let me check out the old entrance and get a close-up picture. The inside of the entrance is covered in graffiti and is obviously in the middle of construction. But the logo is there, waiting to be restored along with the rest of the building. 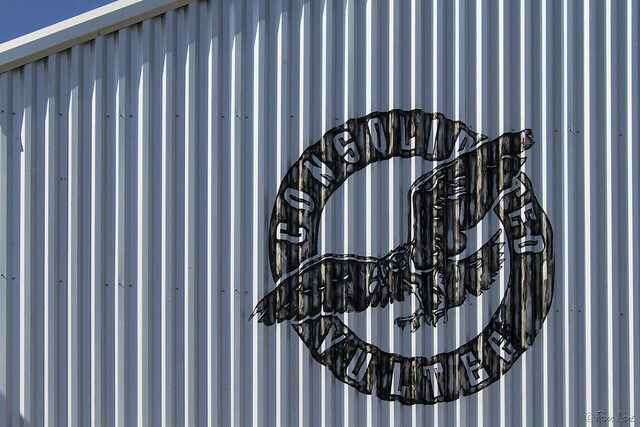 And a copy of the logo now marks the outside of the partially finished building.